Many actors are known for their signature roles. In Becker's case, that role is of a dysfunctional digestive system. 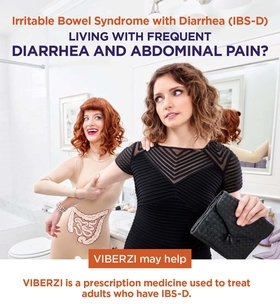 She plays Irritabelle, that adorably annoying redhead in tights in the campaign for Allergan's Viberzi,a prescription drug to treat irritable bowel syndrome with diarrhea. “I've been blown away by the response” to the ad, said Becker, who was once followed from baggage claim to the airport exit by someone who recognized her. In the cottage industry of voice and commercial actors who play diseases and afflicted citizens in healthcare ads, there are a host of actors who welcome the chance to embrace the quirkiness. Take Roger L. Jackson, the voice of Mr. Mucus for Mucinex. He originated the voice and personality of the wiseguy ball of phlegm back in 2004 and played Mr. Mucus for 10 years. “Basically he's a loogie,” Jackson said. “They wanted him to have a New Yorky attitude and sound. Have you ever seen 'Guys and Dolls'? He's B.S. Pully, the guy who plays Big Jule from Chicago,” he added, explaining his inspiration for Mr. Mucus' voice. Paul Guyet is a pharmaceutical ad veteran. He's the voice for Boehringer Ingelheim's heartburn medicine character Captain Zantac and was also a talking fish for AstraZeneca in 2015.